A stunning sterling silver cuff bracelet handmade by Thailand's jewelry artisans. 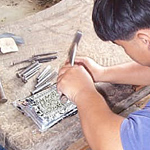 In the Lanna fashion, the silversmiths use pliers, chisels and hammers to work the metal after it has cooled. The bracelet is woven by hand and its box clasp features delicate daisies and leaves. 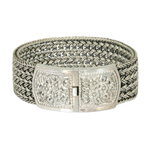 This elegant piece brings a natural appeal to any occasion. 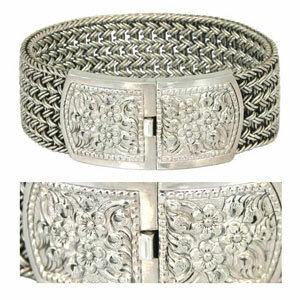 This item is handmade by silver jewelry artisans in a small workshop located in Nan, Thailand.